homemade gift wrap, originally uploaded by molly dunham. Remember the homemade baker's twine from a few posts back? Molly designed it and used it with a $.50 tea towel to wrap home-baked bread. 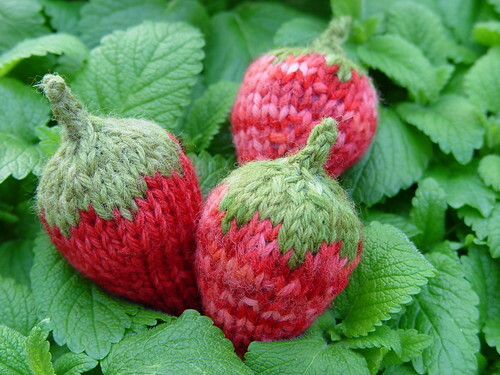 I love her crocheted strawberry and the knitting pattern below would look darling here too. A+ Molly! Strawberries, originally uploaded by pezdiva. Here's the photo to the strawberry pattern by Pezdiva. It is so pretty! She didn't specify but since she said she used Fisherman's yarn which only comes in natural cream, she might have dyed this yarn herself! It is on my project list for Heidi and me. How generous of her to share the pattern! Click the title "Strawberries" below the photo to go to the pattern. Anyone else ready for spring? Stitch up a couple of these cute hairclips in an afternoon and feel the season changing. I love that these projects are a great way to use up scraps! These would make an inexpensive but well received birthday gift for the girl who has everything. I love Strawberries. Just the sight of them fills me with warm happy feelings of late spring and early summer. Until then, here's some links to make a few that will never perish. b. Then cut out 2 larger hearts from white paper with scalloped scissors. c. Cut out 2 smaller hearts from colored paper. d. Tape each end of a ribbon to a white heart. e. Write your message on the colored hearts and glue over the white hearts. f. Tie onto your gift--Voila! 4. Ruched Ribbon Flower from Nikki: (Not a heart, but super cute! This would be adorable on a shirt or skirt.) Same technique could be sewn into a heart shape. Frugal Gift Wrapping--In time for Valentine's Day! When it comes to gift giving, presentation is huge and can cost as much as the gift! The thought of spending a ton on something that will be wadded up and thrown away makes me cringe. Do you save wrapping? In the sub-culture I live in made of my extended family and church family, saving wrapping is expected. There is a designated person at birthday parties and showers to smooth out the paper and tissue and rescue the bows from the trash. I have a box in my basement with gift bags, paper and tissue all saved from previous gifts. I'm not as big on saving the actual paper as I am the tissue. (Telling a child to go ahead and tear the paper brings gasps from the older crowd and a wide-eyed look from the child with a "Really?!!" in response. It makes me feel extravagant to do it, lol.) A good ironing makes tissue look like new, while paper that has been previously taped and crumpled just doesn't get it's finesse back. With reusing in mind, I like gift bags, tulle or wired edged fabric ribbons (travels well, irons out or finger presses and lasts a long time), and furoshiki wrapping cloths. I also love giving a gift where the wrapping is part of the gift. I'll often wrap a baby gift in a homemade receiving blanket with diaper pins and hair elastics to help secure it, and a teether with tulle for a bow. Flour sack towels are great for wrapping wedding gifts. Another good choice for a wedding gift is a laundry basket or hamper "gift bag" filled with bulky every day items like toilet paper and laundry detergent. Check out these blogs for awesome frugal gift giving ideas. I especially like this first one which uses common household items--a plus if you didn't think ahead and are late for the party! 2. Enjoy this Youtube video from www.flairdesignery.com on using tulle for simple and inexpensive package toppers. These gifts are beautiful. It is possible to spend a ton to get these looks, or you can use their ideas for inspiration and gather items from your own yard to make a beautiful package. 5. Hideous, dreadful, stinky, has as a step-by-step basic tutorial for you that doesn't fit her blog name! Even her wrapping pattern overlaps exactly! http://hideousdreadfulstinky.blogspot.com/2009/09/perfect-gift-wrapping-tutorial-part-1.html There are 3 parts to this tutorial, so be sure to click on. 7. Using a brown paper sack and painter's tape! 9. Purse fold furoshiki. I thought of lunch when I saw this one (but it doesn't take much for me to think of food.) If you gave someone a Valentine lunch wrapped up in a cloth like this, their placemat or napkin would be included! 10. I LOVE THIS! Make some homemade baker's twine using the instructions from A Foothill Home Companion: http://foothillhomecompanion.blogspot.com/2009/12/homemade-bakers-twineish.html. This makes the perfect touch for a home-style gift. You have to click over there. 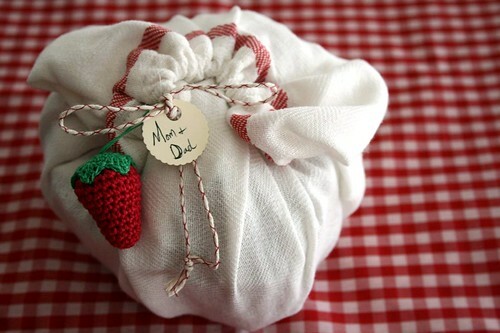 Her pictures are drool quality and she has a gorgeous gift bread wrapped in a white and red tea towel with baker's twine and a crocheted strawberry as a finishing touch! Need ways to save money this Valentine's Day without looking cheap? Taking time to make a special gift yourself takes more effort and thought than picking up something at the store and can save money att he same time. Here are some instructions and recipes to help you get started. Here's a link to a fabulous cooking blog and a post for a homemade sugar cookie pop bouquet. Sometimes life is hard, especially when it involves math. I love it, and Heidi doesn't...yet. After a bout of tears neither of us wanted to do it anymore. So we made a deal. She worked while I did hair and she didn't get any hints or a mirror until that math page was done. The tears turned to giggles and I learned that doing hair can be like spinning and plying wool and sewing all in one--who knew? The style came from this great blog: http://www.princesshairstyles.com/ Where there are a ton a fabulous ideas I can't wait to try out. The other children oohed and ahhed while I worked and I reminded Heidi she could see as soon as her math page was done. That page was finished in record time. Life just feels better when you have cute hair. Here's a great free pattern for you. Make a hat in 10 minutes and donate it to your local Pro-life Clinic or Newborns in Need. It also makes a cute package topper fro your next baby shower gift. This is my favorite baby hat because the knot helps it stay on, its super soft, and it looks so cute! It is best sized for babies weighing 4-7 lbs. My model, Brandon was a plump 9 lbs and though the hat worked, it was plenty snug. Click here to get the pattern. Here's a tutorial for you for a darling skirt that you can make to fit a child or grown person of any size. It is fast and simple to put together and makes a great last minute birthday gift.